On the very same day that her namesake in the Netherlands was relinquishing the throne, our Queen Bee-atrix has decided to abandon her principal residence in favour of one of her offspring, and has moved on, along with a considerable number of attendants. It was all a bit of an unexpected drama. I had beetled over to the hens to collect the day’s egg production (three eggs), when I noticed an odd shape on a tree branch adjacent to the hive. 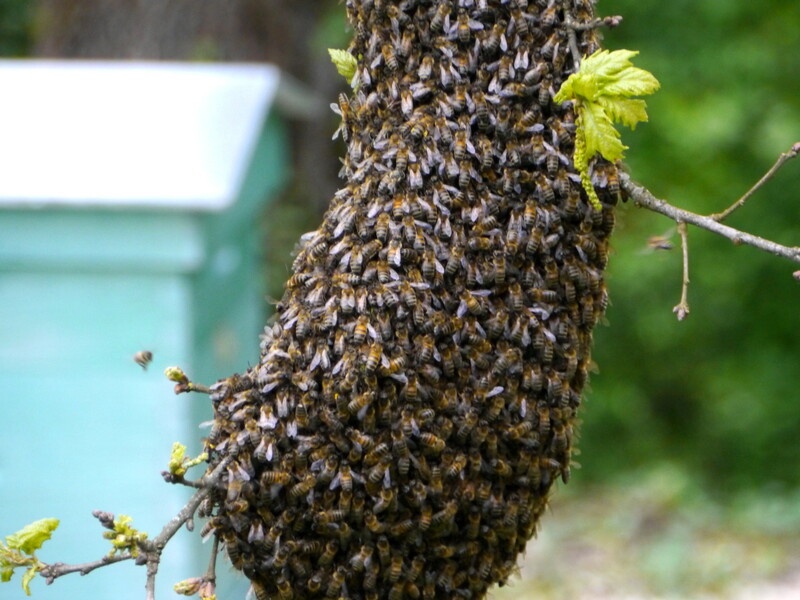 Upon closer inspection it was a seething, buzzing mass of bees – a Swarm! Still being a novice bee-keeper, I had little idea of how to interpret this development – so headed back to the house and the reference books. Andy had just arrived home from work in Colomiers, and we decided that the best course of action was to call our Venerable Beede (VB). He told us that we had to react immediately, otherwise the swarm could be off to pastures new in a matter of hours. So, off sets Andy back to Colomiers to pick up VB and returns an hour later, along with him plus a small nursery hive – I’m not sure what the correct term for this is in English, but in French its ‘ruchette’ , a word I like (and will therefore continue to use). I had already got the smoker lit – I have recently hit upon the idea of using a blow torch to get it going, much less time-consuming. 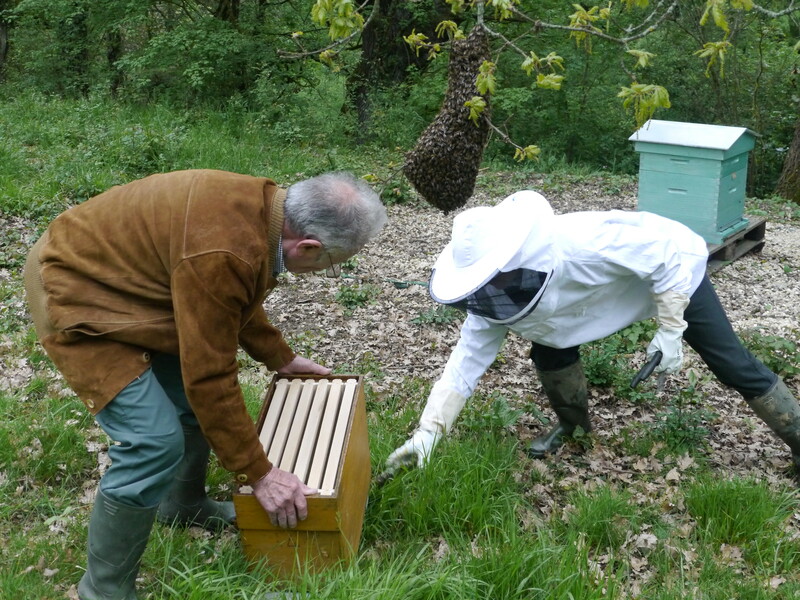 VB slipped on his wellies, whilst Andy and I covered up from head to toe in full bee-keeping regalia. VB is not too impressed with the volume of this swarm, already having tended to some recently at least 10 times larger – in fact he wonders if its not a secondary swarm. 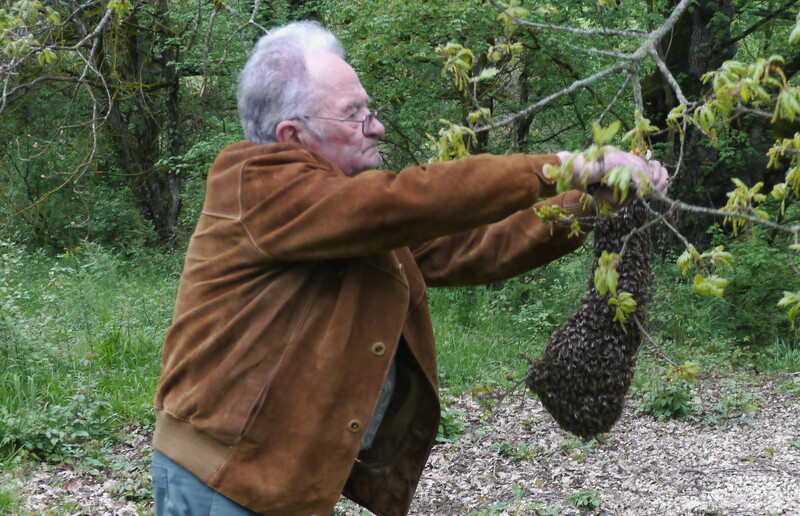 There is much to ponder on the whys and the wherefores of this particular bee behaviour – but for the moment we must concentrate on keeping these bees chez nous. 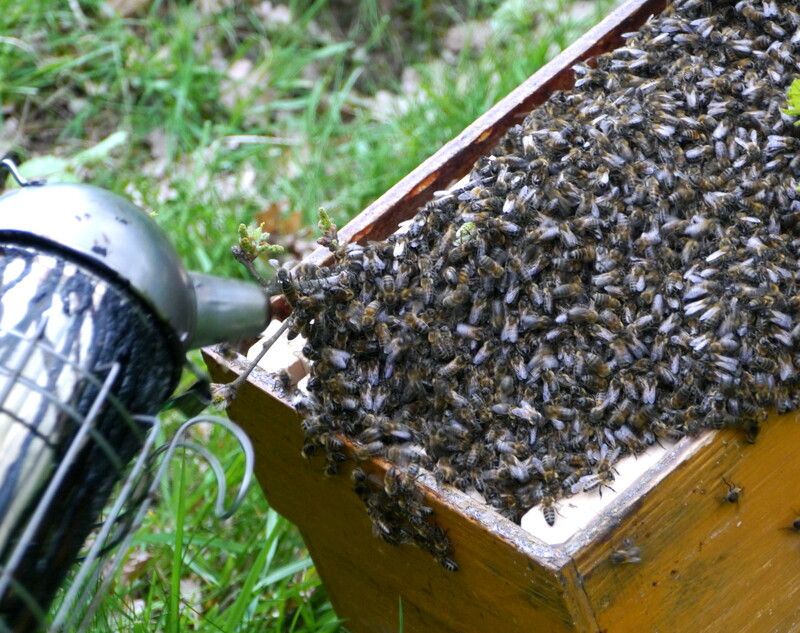 The swarm cluster is actually calm – the bees dont have any brood or honey to defend. So a quick snip with the secateurs, and the cluster is laid on the waiting frames of the ruchette. 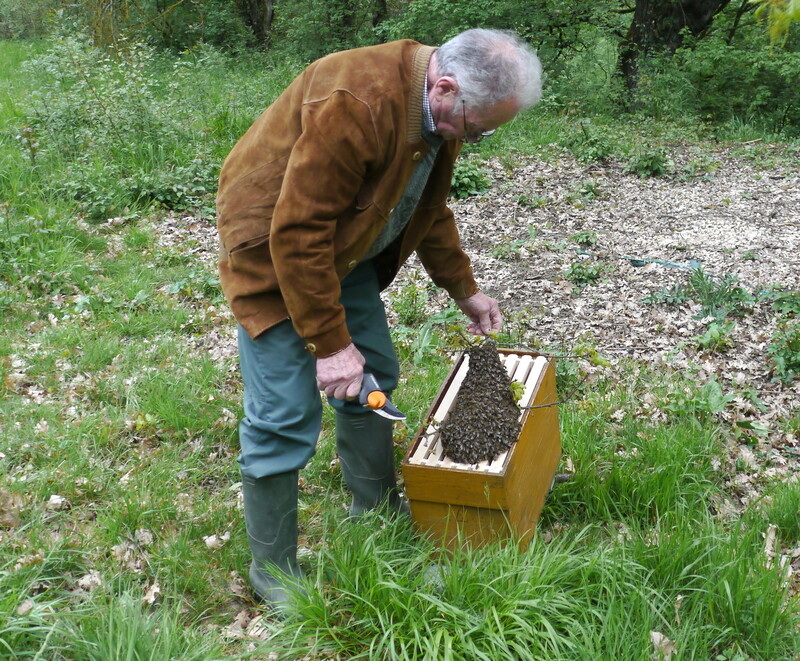 We shall keep these bees in the ruchette for 3 or 4 weeks, providing nourishment. 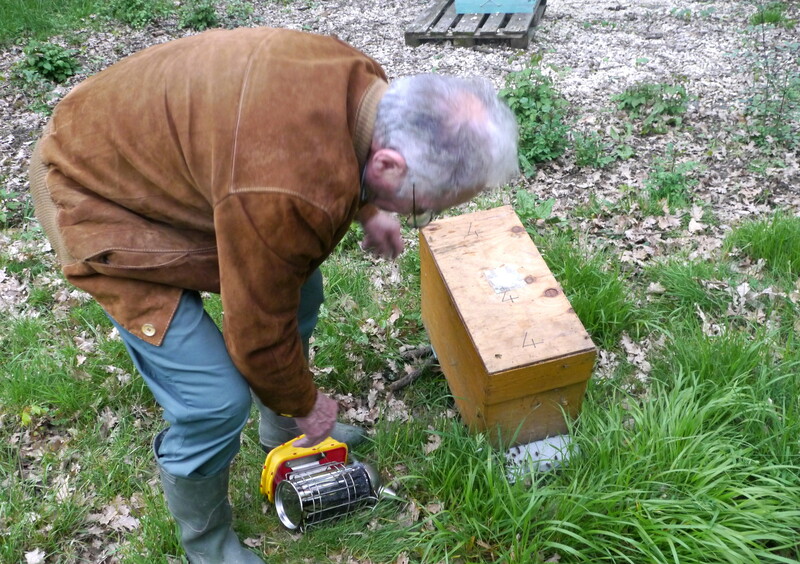 And in the meantime have to get a second hive prepared, the same as the first one. This will be placed in exactly the same location as the ruchette – and when we feel that the bees and the frames are settled they will be transferred to their new permanent (hopefully) residence. We shall also be investing in one or two ruchettes – so that, should there be another episode like this, we can handle it ourselves, having been shown the way by the Master! 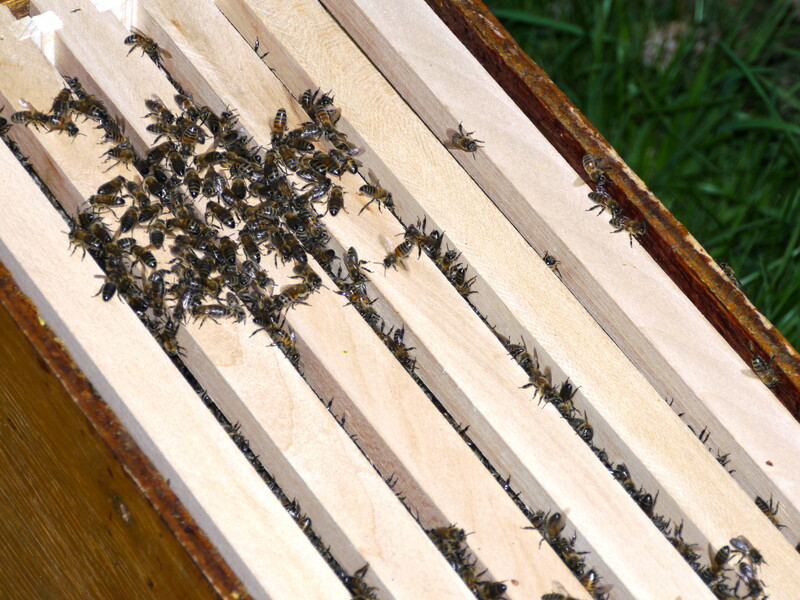 Once the bees had dropped into the box, a cover was added and then the lid – VB ensuring that every last, single bee had found its way into the ruchette – there were still some bees arriving late wondering what had happened to the swarm. The ruchette was carefully placed on a new palette – I still had work to do making a syrup solution, and Andy was off for the third time that day on a Colomiers round-trip to take VB back home (after we had toasted the evening’s work with a small glass of vin cuit).